Elaine Costello, an aviation enthusiast from Romford but who is staying in Southwick, was recorded the Hawker Hunter plane as it performed a loop. Seconds later, the aircraft slammed into the A27, just north of Shoreham Airport, erupting into a ball of flames. Ms Costello, 50, said: “It was horrifying. I was totally shocked by it. I have never seen anything like it before. 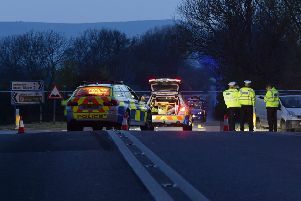 The crash took place at about 1.20pm, with emergency services reporting that the plane hit a number of cars on the A27, leaving several people seriously injured. Describing the scene, Ms Costello said: “There were just flames and black smoke coming out. Ms Costello said there was a great deal of confusion, from spectators, in the aftermath of the tragedy. Airshow organisers have told people to remain at the airport. Traffic is also reported to have been seriously affected, with the A27 closed in both directions. The cause of the crash is unknown. However, air crash investigators have been informed and will conduct an examination into the incident. For the latest information about the incident and comments on social media see our live blog Don’t miss out on all the latest breaking news where you live.